Ariosa is a 2 way compact speaker with AMT (air-motion-transformer). The kit provides an air motion tranformer (AMT) and a woofer. The AMT is the Gradient AT1R and the woofer is a Seas CA15RLY. Ariosa is developed by Thomas Schmidt. The crossover consists of a 3rd order high-pass filter (18 dB per octave slope) for the tweeter. The woofer is connected to a 2nd order low-pass filter (12 dB per octave slope). 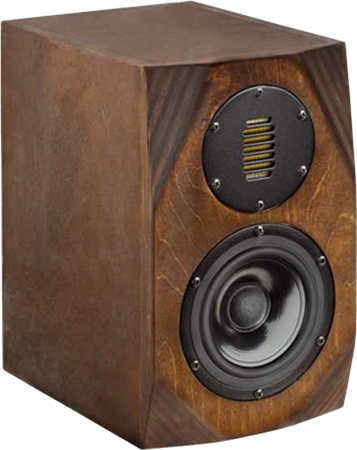 Between 100 Hz and 20000 Hz the frequency response of this loudspeaker is linear on axis. The decay spectrum is nearly perfect. At low volume, i.e. 85 dB at 1 m, the nonlinear distortions are lower than 0.5% above 500 Hz and below 1% at 95 dB at 1 m .